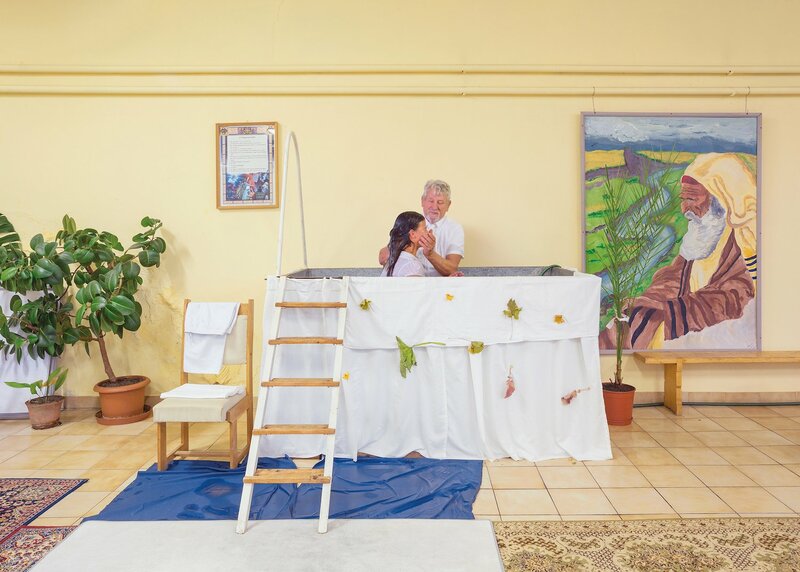 Furnishing the Sacred by Boglárka Éva Zellei explores the visual language of contemporary Christian communities in Hungary through the lens of immersion baptism. 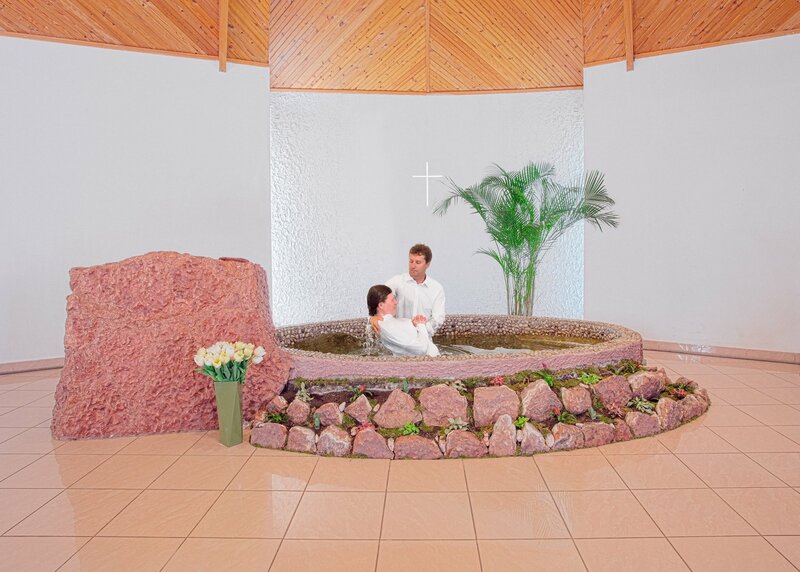 Although the ceremony has existed for more than 2,000 years, each church presents a unique environment for this sacred event, with various settings displaying a range of different approaches towards religious life. 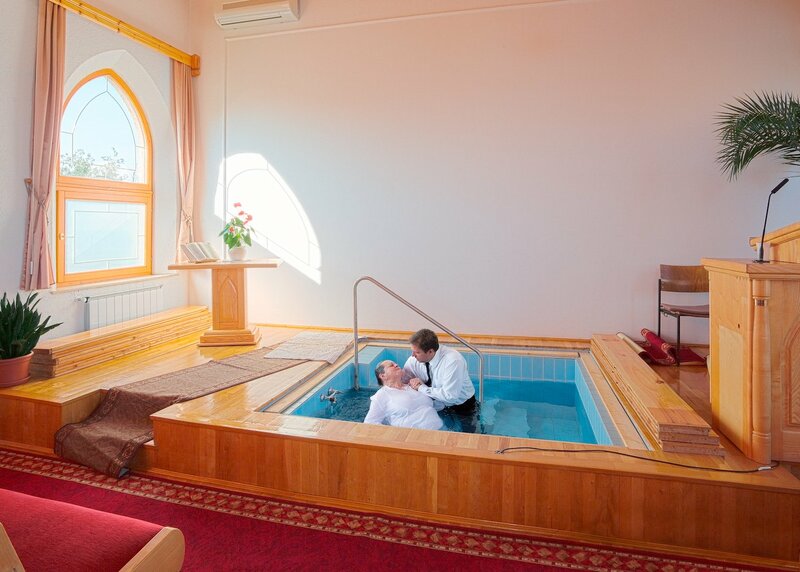 My work revolves around Christianity in Hungary and my experience as a young Central Eastern European Christian. I began by exploring how traditions fit into modern culture. I also wanted to show the richness of traditions. I find my personal engagement and experience in religion a tool for empathy. It feels like you can only be conservative or liberal in Hungary, and it sometimes feels the only way people can understand each other here. We don’t have a culture of discussion, we live in bubbles. I really enjoy meeting people from different spheres of life. I find it inspiring to listen to reflections on my work when I show it to people who grew up in a different cultural environment. Despite, being an active member of the Christian community I chose to take an analytical approach and sometimes be critical in my work. 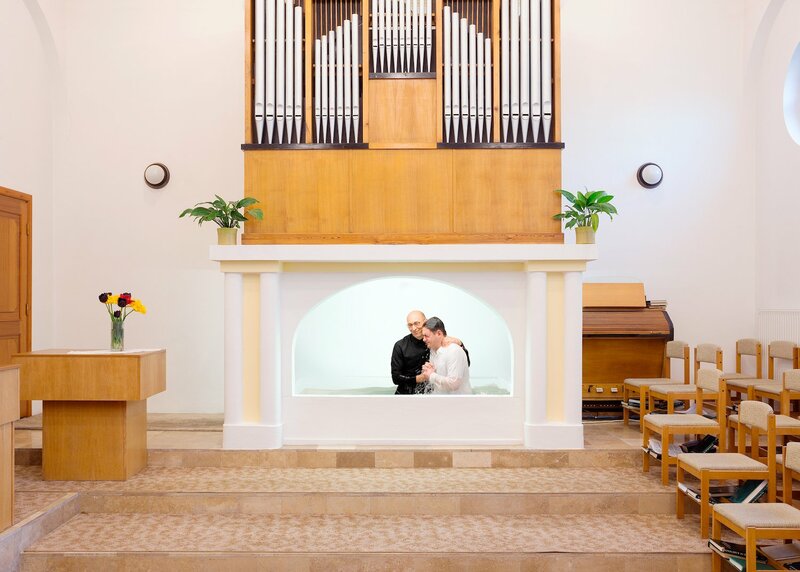 My series Furnishing the Sacred came out of my own experience of going to a Free Christian church when I was a kid, and finding photos of baptisms uploaded by community members online. 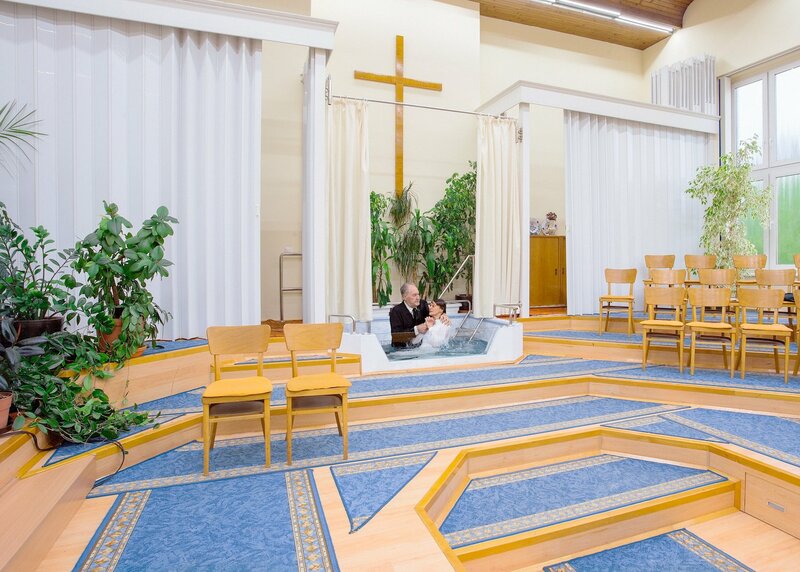 In my other projects I’m inspired by more grassroot approaches, when young Christian people organise alternative events and activities in church. I usually find out about them through personal contacts and online events listings. 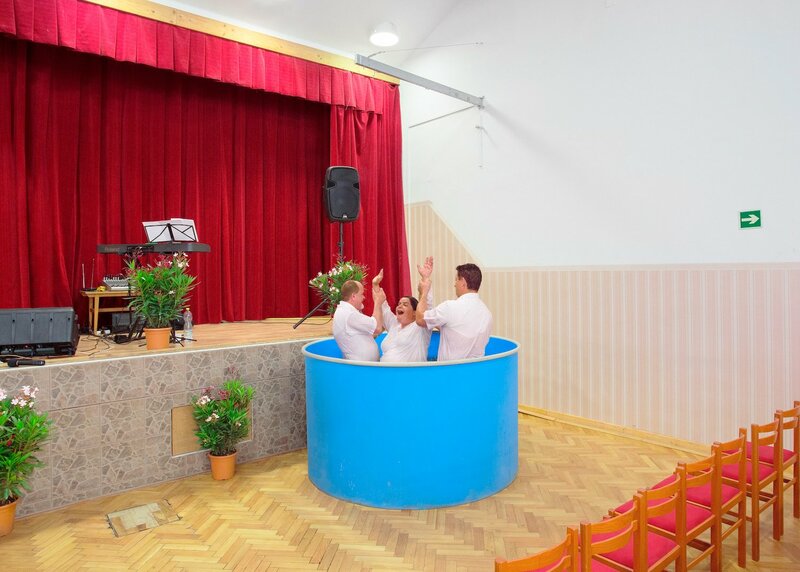 They needed two men for this event because they baptised 30 people on the day (it’s usually one to ten people per year). 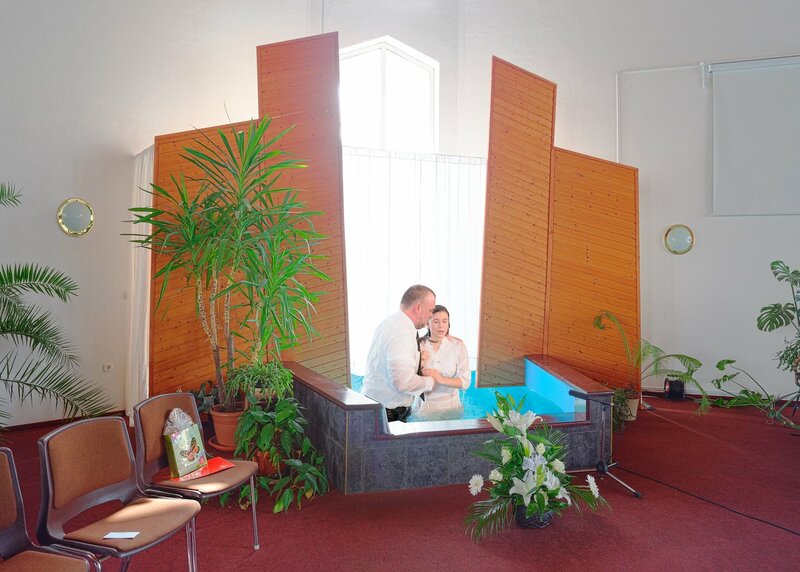 The baptism always takes place during a church service. Usually the members of the community take part in singing, playing instruments, or reading poetry. But at this one church the girls performed a dance and two boys performed a rap song. 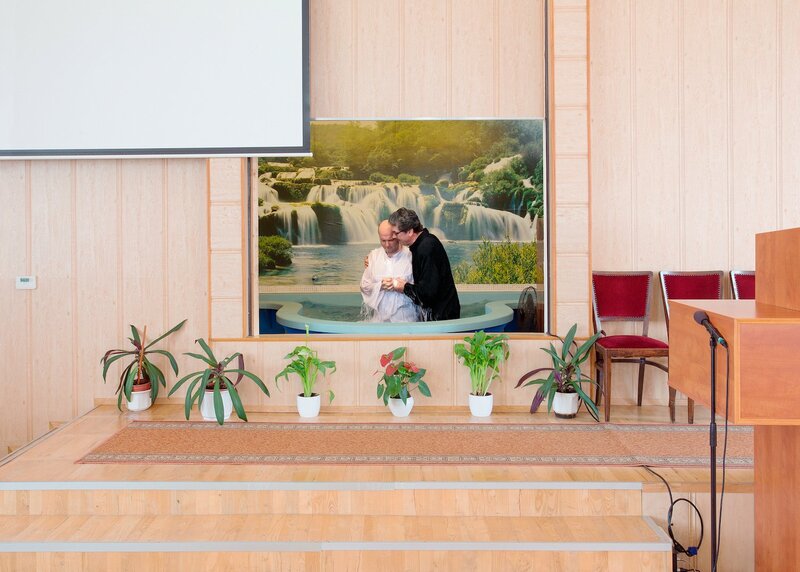 The music was also really energetic — worship songs combined with Roma dance music. The whole event took around three hours. It was really lively. 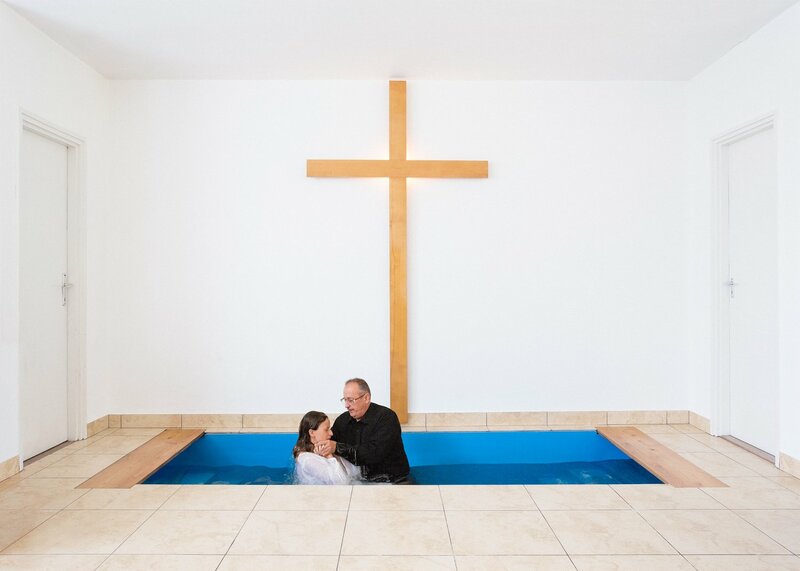 The people who were baptised were so excited and emotionally moved by the experience they almost fainted when they emerged out of the water. To be honest, I don’t have an Instagram profile, but nowadays it seems more and more important to have one. I think it influences the way photographers promote themselves, and the process by which critics or curator find fresh works. As a photographer, I imagine it influences not only where you publish your works, but how you photograph. The fact that we mostly see these in a relatively small size can affect the style and qualities of photography. This is a platform where photographers are also able to show behind the scenes of their photos, and maybe by sharing these glimpses, we are demystifying art. It’s easier for the general viewer to get a sneak peak into the “art world”, but artists also have to cope with the ever-growing attention. Exaggerated intimacy; the uncanny, the weird, and bizarre; photographing friends naked; deserted places and broken dreams; borderlands; poor but beautiful people; fact and fiction. In Budapest there is a very small but active art scene. I’ve witnessed friends’ projects develop and am contintually inspired by other artists. I’ve also been involved in photographing various events and exhibitions, and it motivates me very much. We have many financial, instutitional, and political problems, but it means a lot to take part in projects that nurture a community. Overcoming challenges is also something I find motivating. I’m a member of a Christian movement which is trying to build bridges between gay people, Christian people, and the church. Everything I do is to help this goal. Moreover, I’ve gone on a whole personal journey in developing my projects and becoming a photographer. I’ve had to to really become better at communication; today, my goals as an artist are intervowen with my personal objectives.